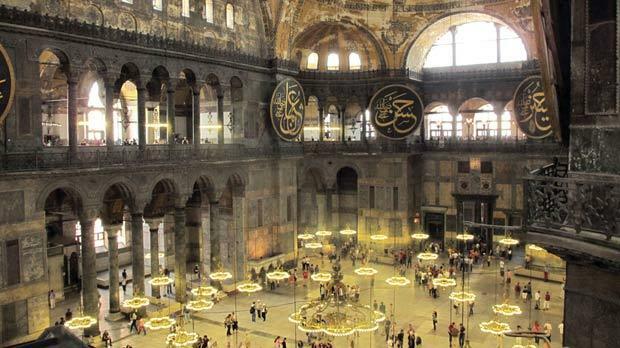 The interior of Hagia Sophia. 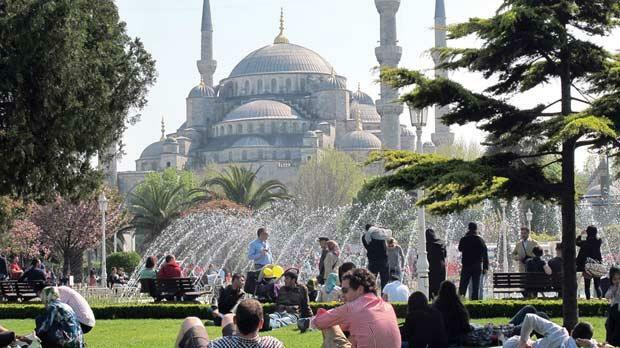 The park that separates the Blue Mosque and Hagia Sophia is a centuries-old favourite spot for many locals. 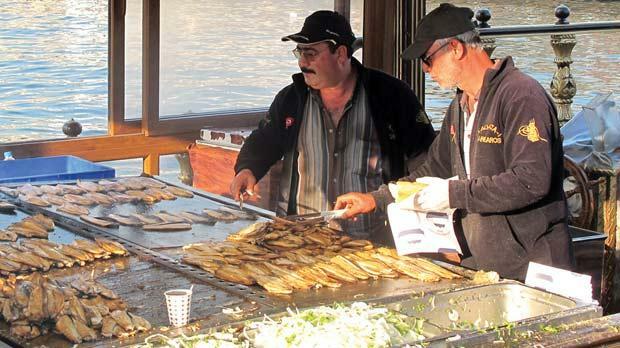 The preparation of fish sandwiches on uncovered grills releases an unmistakable smell into the sea air. Inside an ancient spice bazaar. 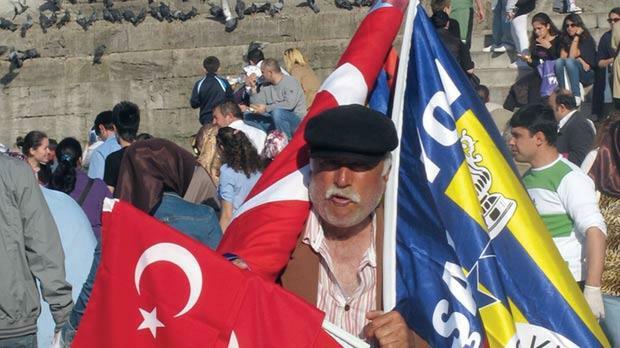 Istanbul attracts every type of visitor imaginable. 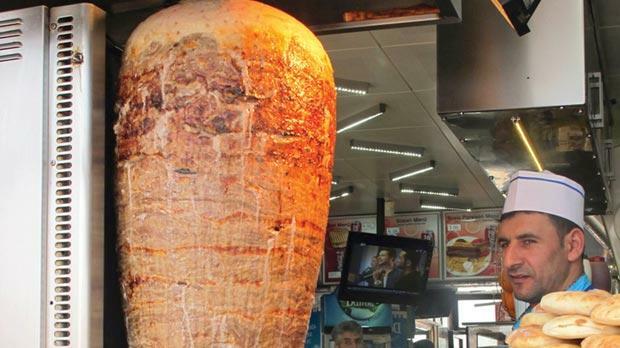 A kebab seller gets ready to serve another hungry customer. 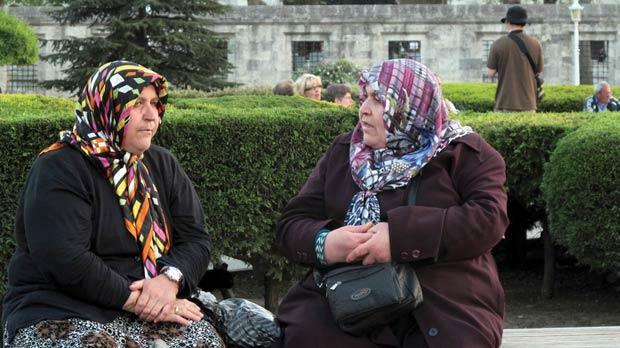 Two old women gossip near the Blue Mosque. A narrow cobbled street meanders downhill alongside the Hagia Sophia, a mammoth building that has existed both as a church and a mosque in its 1,500-year history. Colourful 19th century wooden houses line the other side, exemplifying the east-meets-west style of Istanbul. The Cat Café has an unassuming spot on the slope of the hill; candles flicker from natural holes in the stone wall, softly illuminating a booth of cushioned seats and the sweet tobacco smoke from people puffing on shisha pipes. Everyone who goes to Istanbul has a favourite place. It could be in a royal palace ogling a four-and-a-half ton chandelier, relaxing in a park surrounded by 15th century architecture, or gaping at the ornate decoration of a famous mosque. But it’s equally as likely to be enjoying the sunset on a rooftop terrace or watching the world go by from the dreamy ambiance of a café in one of Istanbul’s side streets. The city assaults the senses, sensitively taking you on an audio-visual journey until you feel totally encapsulated with it. Even your nostrils get a workout. Inside the ancient spice bazaar a wonderful blend of vanilla, saffron, tea and chilli floats underneath the grand archways and lofty ceilings. 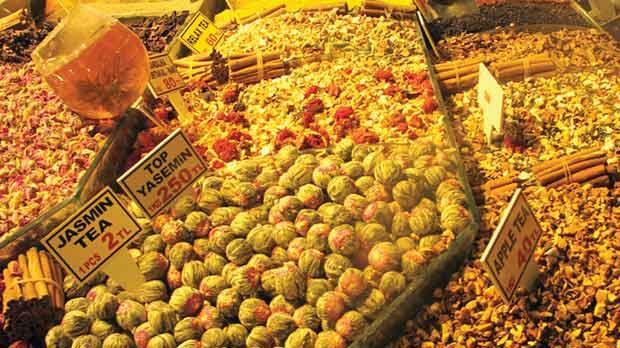 Some stalls advertise Sultan’s spice; a supposed aphrodisiac that helped the Sultan through 20 of his harem in a single night. Across the street, the preparation of fish sandwiches on uncovered grills releases an unmistakable smell into the sea air. Men line a bridge across the Bosporus, hanging their fishing rods into the blue water, passing their day with cups of chai and chatter until they become an army of silhouettes when the sun sets spectacularly over the old city. Their catch is immediately sent downstairs to a series of restaurants. Iconic experiences like this define Istanbul, pulling you deeper into the city’s spellbinding web. Five times a day life momentarily pauses. In other Middle Eastern cities various mosques seem to compete with each other when they call to prayer, attempting to outdo each other with increasingly outlandish throat warbles. In Istanbul the call from the Blue Mosque echoes through the air and the city briefly stops to allow the cacophony to pass through the streets. Silence. Other mosques return the call, the natural cadence making the city walls feel like a hypnotic choir. Then life moves on again; people bite into their kebabs, lovers resume their conversations, seagulls drift into the distance. From the outside the Blue Mosque is not blue. Dependent on the angle of the sun it softly changes from dull silver to a delicate shade of shimmering red throughout the day. Inside, mesmeric nuances in design and shades of blue cover each wall, pillar and crevasse, giving this 15th century edifice its name. It’s in the heart of the old city, Sultanahmet, and faces a second evocative landmark: Hagia Sophia. A park separates the two, providing a space for people to sit and admire on wooden benches. This is a centuries-old favourite spot for many locals. An old man serves tea in plastic cups, monotonously shouting “chai bar, chai bar” throughout the day, maintaining his equanimity even when the area bulges with tourists at the weekend. It’s a great people watching spot. 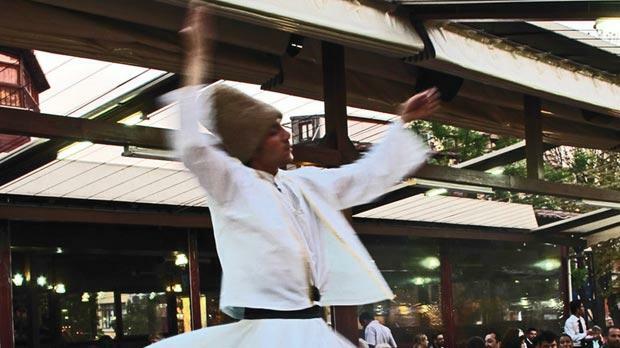 Istanbul attracts as diverse a range of tourists as anywhere in the world. A mix of those that have travelled east and those venturing from the west; women in designer outfits and men in sandals and socks; schoolchildren in immaculate uniforms and pensioners following a guided tour; smelly, unshaven backpackers and well dressed couples hand in hand. The authorities must take credit for maximising the cities appeal. Sultanahmet is practically pedestrianised, so although it may be busy with people it never feels overly stressful. The Hagia Sophia is considered the first masterpiece of Byzantine architecture and served as the largest cathedral in the world for almost 11 centuries until it was converted into a mosque in 1453. Its size is overwhelming. Mosaics of the Virgin Mary and Jesus overlook huge gold on black Arabic mantras that hang underneath a giant dome. Natural light from the 40 windows around the dome complements the artificial light from bare light bulbs beneath, exemplifying the buildings mystique. Domes are popular in Istanbul, embellishing the beauty of most buildings. On another side street small holes in a domed ceiling allow soft beams of light into the bare room. Men have been getting cleaned in this austere room since 1586 and despite the bare and seemingly dank surroundings it’s incredibly salubrious. They sweat on hard hot stones awaiting the arrival of one of the short old men with protruding pot bellies. These men have a rather unique occupation. Producing a candy floss-like roll of soap they scrub customers with hands and elbows, removing layer after layer of muck and dirt and skin. Around the corner the larger and more elaborate domes of the Grand Bazaar enclose one of the world’s oldest surviving trading spaces. It feels like a degree of sanitisation has taken place over the past few decades but it’s still very different from the tedious international chains that litter Western shopping centres. It’s intense; a never ending flow of shoppers walking the zigzag streets past tightly packed shops selling everything you want but nothing you need, each store a family business that has been enticing customers for centuries. The maze of indoor streets daze and confuse until you crave the familiarity of your favourite place. Ali, the owner of the side street cafe, brings out a complementary cup of tea. Sit back, grab the sheesha pipe, let your senses unwind… because tomorrow, Istanbul will give you a completely different display of sights, sounds and smells.